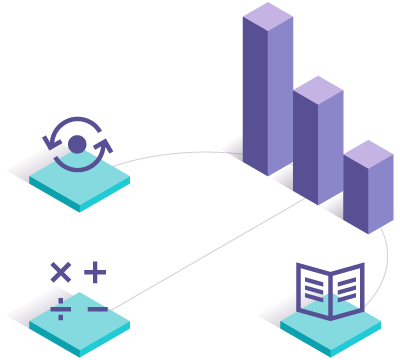 Get to outcomes-based data quickly with a better way to collect, measure, and report on learning outcomes achievement. Engage faculty with user-friendly technology to collect and score authentic student work against rubrics, and report on assessment. Ease the burden on faculty with a variety of user-friendly methods for uploading and evaluating student artifacts against standard rubrics. Our intuitive system simplifies the scoring process and makes it easy to manage multiple scoring rounds. We designed our interactive reports with powerful visualizations to help simplify analysis. Filter outcomes reports to disaggregate data by key demographics and analyze scores by rubric criterion to quickly see what’s happening with student learning. 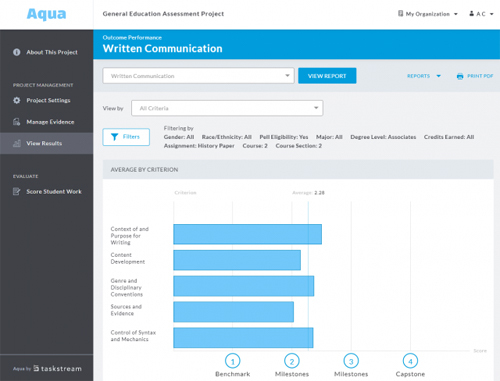 Easily organize assessment efforts and generate meaningful data quickly. Our sleek interface puts faculty engagement at the heart of the experience. Intuitive controls and streamlined navigation provide easy visibility into action items and make evaluating artifacts quick and easy. 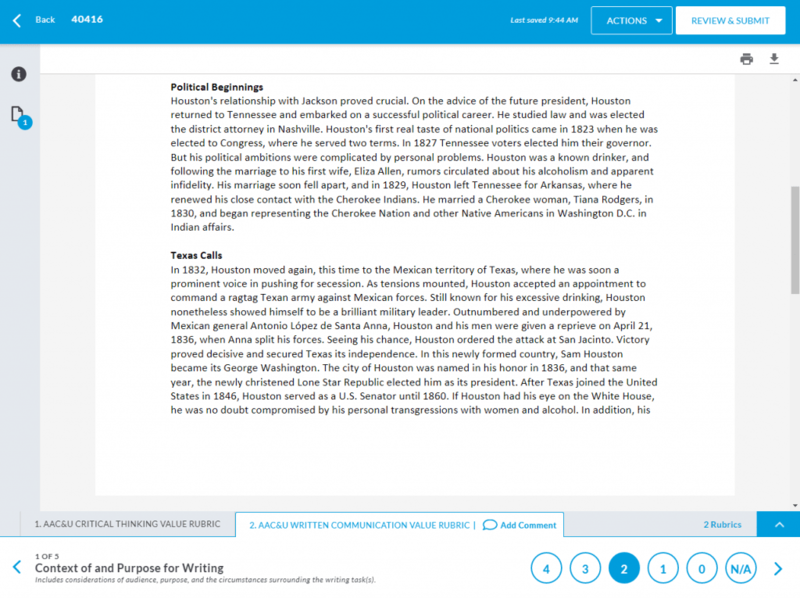 Upload student work manually, in bulk, or through your LMS. You can view submissions and score many types of artifacts, including Word docs, PowerPoint slides, PDFs, and videos up to 500MB. Instead of standardized tests or surveys, our purpose-built system uses rubrics to score actual student coursework. This generates more meaningful data more quickly and enables better assessment of essential knowledge and critical skills. Project dashboards help you stay on track with a quicker, easier way to monitor the status of assessment initiatives, manage multiple rounds of scoring, and distribute work to faculty for evaluation. Assess learning and generate outcomes-based data more easily. Faculty can easily score submissions on tablet devices for on-the-go convenience. Manage multiple scoring rounds to establish consistency among multiple evaluators. Powerful visualizations and filters help you analyze and disaggregate data. Filter outcomes reports to drill down into key demographic data. Evaluate essential skills and learning across institutions, states, and consortia. Assess specific learning outcomes that rely on videos to show student work. Assess learning and generate outcomes-based data more easily. 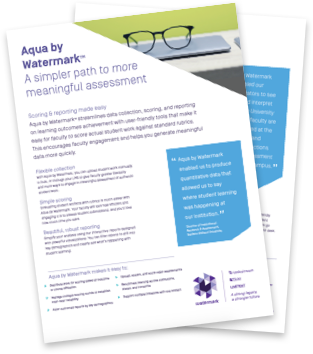 Download the flyer to learn more about finding a simpler path to more meaningful assessment. "We knew student learning was happening at our institution, but we didn't have a lot of data we could point to and say, 'Oh yes, this is where it's happening.' Aqua by Watermark enabled us to produce quantitative data that allowed us to say that."